Old school Bollywood poster of the Hindi film Chambal Ka Badshah (1986) for sale. 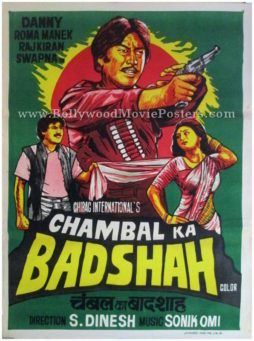 Featured here is an actual surviving old Bollywood poster for sale of the 1986 Hindi movie Chambal Ka Badshah. Directed by S. Dinesh, the film starred Danny Denzongpa and Raj Kiran in lead roles. Printed and circulated a few years after the first release of the film (somewhere in the late 1980s), this old school Bollywood poster was originally designed for publicity of the film but never ended up being used. Danny Denzongpa is seen prominently in a bandit avatar. At the bottom, lead couple Raj Kiran and Sapna are seen in quirky avatars in a dancing pose taken from one of the songs in the film. The faces of the stars are painted in yellow, similar to “The Simpsons.” This old school Bollywood poster features a stunning use of bright shades, giving it a very eye catching appearance. 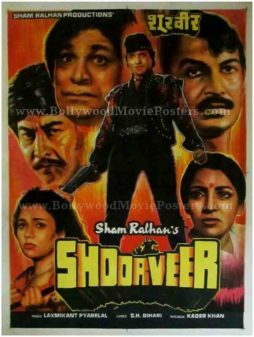 Old Bollywood poster for sale of the classic Hindi film Shoorveer (1988). This is an actual surviving old Hindi movie poster for sale of the 1988 Bollywood film that starred Rajan Sippy, Mandakini and Deepti Naval in pivotal roles. 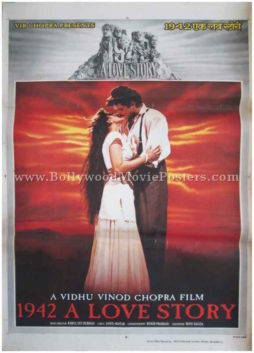 Printed and circulated during the initial release run of the film (somewhere in the late 1980s), this vintage Bollywood poster for sale was designed for publicity of the film but never ended up being used. This old Hindi movie poster was originally hand designed in oil on canvas format by a small time art studio. 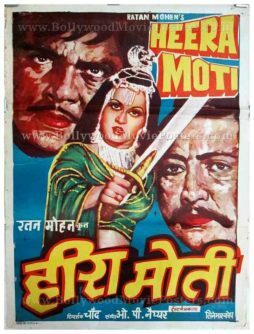 The quirky hand drawn techniques of old school Bollywood poster painters is starkly evident in this old Bollywood poster. Quirky hand painted portraits of the lead actors are seen in various poses in this vintage Bollywood poster. The hero of the film, Rajan Sippy is seen prominently in the center in a crusader like avatar. Large hand drawn faces of Mandakini, Deepti Naval, Danny Denzongpa, Suresh Oberoi and Kader Khan are seen surrounding the hero’s portrait. The background of this old movie poster has streaks of yellow and orange, giving it a very catchy appearance. Old Bollywood poster of the romantic Hindi film Laila Majnu (1976) for sale. 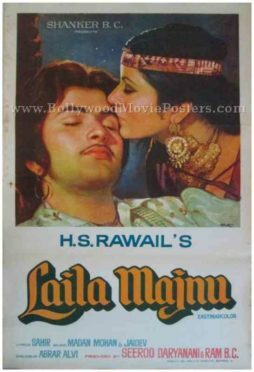 This is an actual surviving original old Bollywood poster of the 1976 classic Hindi romance, Laila Majnu. Directed by Harnam Singh Rawail (H.S. Rawail), the film starred Rishi Kapoor and Ranjeeta in lead roles. Laila Majnu was based on the ancient Arabic folklore of Layla and Majnun. Printed and circulated during the first release run of the film (mid 1970s), this original Laila Majnu poster was designed for publicity of the film but never ended up being used. This Laila Majnu poster was originally designed in hand painted oil on canvas format by one of the greatest Bollywood poster artists of his time, V.G. Parchure. His printed signature in the name of his art studio “Pamart” is seen on the center right of this old Bollywood poster for sale. A beautiful hand painted rendition of the two lovers is seen prominently in this old Bollywood poster. Artist V.G. Parchure has chosen a minimalist approach with a focus on realism in designing this old Bollywood poster. 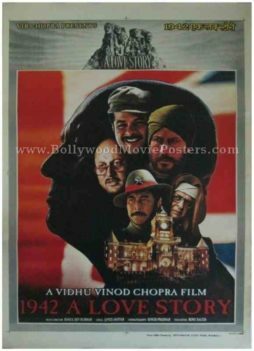 Classic Bollywood movie poster of the Hindi film Army (1996) for sale. 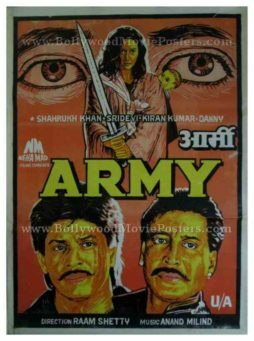 Featured here for sale is an actual surviving classic Bollywood poster of the 1996 action film Army, which starred the the “King of Bollywood,” superstar Shahrukh Khan in the lead role. Army was released at a time when movie poster design techniques in India had completely shifted from handmade to digital. As such, no hand painted or hand drawn movie posters of this film were ever made during the publicity campaign surrounding its first release. This rare Shahrukh Khan poster which features a quirky hand drawn portrait of the superstar is one among few surviving hand drawn Shahrukh Khan posters known to exist in the world, making it highly collectible! Printed and circulated a few years after the first release of the film (late 1990s), this quirky hand drawn old Shahrukh Khan poster was originally designed for publicity of the re-release of the film but never ended up being used. This poster was originally designed in hand painted format on canvas by a small time Bollywood poster art studio in Kolkata, making it very collectible. Quirky hand drawn portraits of Shahrukh Khan, Sridevi and Danny are seen in an almost Simpsons-like avatar. The background of this hand painted Shahrukh Khan poster is red, giving it a very quirky appearance. Hand painted Bollywood poster of the old Hindi film, The Burning Train (1980) for sale. 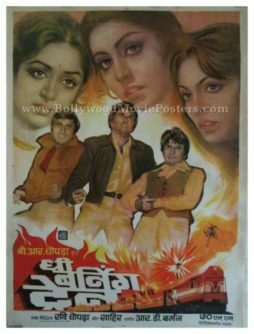 This is an actual surviving hand painted Hindi movie poster of the 1980 action drama that featured a stellar star cast comprising Dharmendra, Hema Malini, Vinod Khanna, Parveen Babi, Neetu Singh, Vinod Mehra, Jeetendra and Simi Garewal, besides others. Printed and circulated somewhere in the 1980s, this hand painted Indian film poster was printed for publicity of the film but never ended up being used. This hand painted Bollywood movie poster was originally designed on canvas, giving it a very quirky appearance. The burning train is seen at the bottom of the poster, while quirky hand drawn portraits of the lead actors appear on the top. Old hand drawn Bollywood poster of the romantic Hindi film Love Story (1981) for sale. This is an actual surviving vintage Bollywood poster of the 1981 Hindi movie produced by Rajendra Kumar that starred him alongside his debutante son Kumar Gaurav. Rajendra Kumar made Love Story to launch his son Kumar Gaurav into Bollywood stardom. The Film was a hit at the box office, turning Kumar Gaurav into an overnight sensation. The innocent pair of Kumar Gaurav and Vijayta Pandit – both making their onscreen debut – along with chart topping songs such as “Yaad aa rahi hai” ensured the film’s success at the box office. Printed and circulated a few years after the original first release of the film in the 1980s, this old hand drawn Bollywood movie poster was printed for publicity of the film but never ended up being used. This vintage Bollywood poster was originally designed on a hand drawn canvas by a small time poster art studio in Delhi, giving it a very quirky appearance. 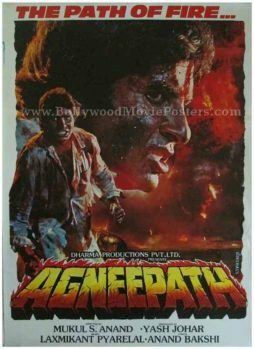 Old Bollywood movie poster of the cult Hindi film, Agneepath (1990) for sale. 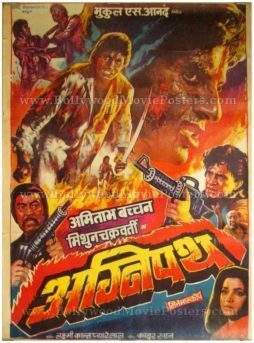 This is an actual surviving vintage Bollywood poster of the 1990 cult film that featured the greatest superstar of Indian cinema, Amitabh Bachchan in the lead role. 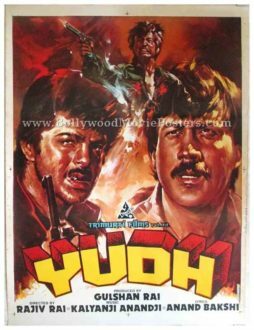 Amitabh Bachchan and Mithun Chakraborty received the National Film Award for Best Actor and Filmfare Best Supporting Actor Award respectively for their performances in this action drama, making this poster highly collectible! Printed and circulated a few years after the first release of the film (mid 1990s), this vintage Bollywood movie poster was originally designed for publicity of the film but never ended up being used. This Amitabh Bachchan poster features a rare combination of both photographic as well as hand painted artwork. A large photographic close up of Amitabh together with a smaller full length photo of his appear on the top of this poster. Amitabh is seen holding a sword in a still taken from the climax of the film. Faces of Danny and Mithun are seen hand painted at the bottom holding machine guns. Smaller still photos of Tinnu Anand and actress Neelam are also seen amidst the hand painted flames in this Agneepath poster. Quirky hand drawn vintage Bollywood poster of the Hindi film, Jagir (1984) for sale. This is an actual surviving old publicity poster of the 1984 Bollywood movie that starred Dharmendra and Mithun Chakraborty in lead roles. Printed and circulated a few years after the first release of the film (somewhere in the late 1980s), this old Bollywood poster was originally designed for publicity of the film but never ended up being used. The poster features an interesting quirky design which is somewhat similar to a western classic movie. Lead actor Dharmendra is seen wearing a cowboy hat. An eagle is seen perched on his shoulder. 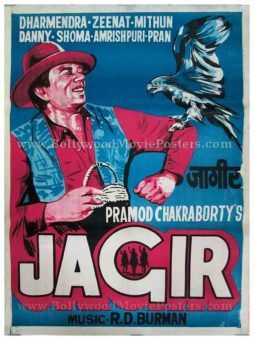 Jagir is a 1984 Bollywood movie starring Dharmendra, Mithun Chakraborty, Zeenat Aman, Pran, Danny Denzongpa and Amrish Puri. Music for the film was composed by ace music director R D Burman.